1987-1995 Jeep Wrangler(YJ) Smittybilt Fender Flares - 6" Wide - Abs Plastic Textured Black (17191). 6" Wide Front and Rear Fender Flare Kit by Smittybilt. 4 Pieces, ABS Plastic, Textured Black. Hardware included. 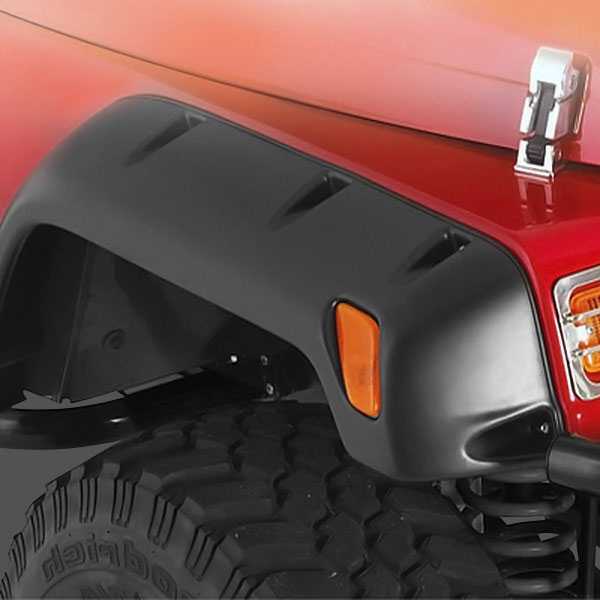 These extra wide fender flares will provide more protection than the factory units, especially when running oversized off-road tires, and give your Jeep a rugged look. They'll also keep you legal in areas that require complete tire coverage. Made of textured UV stable ABS plastic, these flares are paintable and designed to replace your factory flares. They come as a set and are available individually. 2007-2013 Chevy Silverado 1500 Smittybilt M1 Fender Flares Bolt On Black (17290). Front and Rear M1 Fender Flares by Smittybilt. Set of 4 Pieces, Height: 6", Bolt On, Textured Black. These fender flares will provide additional tire coverage, essential for protecting the bodywork when running oversized off-road tires, and give your truck a brawny, rugged look. Made of textured UV stable, heat resistant, ABS plastic, these flares are paintable and come with everything required for an easy, no drilling required, installation. 2007-2014 Chevy Silverado 2500 HD Smittybilt M1 Fender Flares Bolt On Black (17290). Front and Rear M1 Fender Flares by Smittybilt. Set of 4 Pieces, Height: 6", Bolt On, Textured Black. These fender flares will provide additional tire coverage, essential for protecting the bodywork when running oversized off-road tires, and give your truck a brawny, rugged look. Made of textured UV stable, heat resistant, ABS plastic, these flares are paintable and come with everything required for an easy, no drilling required, installation. 2007-2014 Chevy Silverado 3500 HD Smittybilt M1 Fender Flares Bolt On Black (17290). Front and Rear M1 Fender Flares by Smittybilt. Set of 4 Pieces, Height: 6", Bolt On, Textured Black. These fender flares will provide additional tire coverage, essential for protecting the bodywork when running oversized off-road tires, and give your truck a brawny, rugged look. Made of textured UV stable, heat resistant, ABS plastic, these flares are paintable and come with everything required for an easy, no drilling required, installation. 2014-2015 Chevy Silverado 1500 Smittybilt M1 Fender Flares Bolt On Black (17291). Front and Rear M1 Fender Flares by Smittybilt. Set of 4 Pieces, Height: 6", Bolt On, Textured Black. These fender flares will provide additional tire coverage, essential for protecting the bodywork when running oversized off-road tires, and give your truck a brawny, rugged look. Made of textured UV stable, heat resistant, ABS plastic, these flares are paintable and come with everything required for an easy, no drilling required, installation. 2014-2015 Chevy Silverado 1500 Smittybilt M1 Fender Flares Bolt On Black (17292). Front and Rear M1 Fender Flares by Smittybilt. Set of 4 Pieces, Height: 6", Bolt On, Textured Black. These fender flares will provide additional tire coverage, essential for protecting the bodywork when running oversized off-road tires, and give your truck a brawny, rugged look. Made of textured UV stable, heat resistant, ABS plastic, these flares are paintable and come with everything required for an easy, no drilling required, installation. 2014-2015 Chevy Silverado 2500 HD Smittybilt M1 Fender Flares Bolt On Black (17292). Front and Rear M1 Fender Flares by Smittybilt. Set of 4 Pieces, Height: 6", Bolt On, Textured Black. These fender flares will provide additional tire coverage, essential for protecting the bodywork when running oversized off-road tires, and give your truck a brawny, rugged look. Made of textured UV stable, heat resistant, ABS plastic, these flares are paintable and come with everything required for an easy, no drilling required, installation. 2007-2013 Chevy Silverado 1500 Smittybilt M1 Fender Flares Bolt On Black (17293). Front and Rear M1 Fender Flares by Smittybilt. Set of 4 Pieces, Height: 6", Bolt On, Textured Black. These fender flares will provide additional tire coverage, essential for protecting the bodywork when running oversized off-road tires, and give your truck a brawny, rugged look. Made of textured UV stable, heat resistant, ABS plastic, these flares are paintable and come with everything required for an easy, no drilling required, installation. 1999-2007 Ford F-250 Superduty Smittybilt M1 Fender Flares Bolt On Black (17390). Front and Rear M1 Fender Flares by Smittybilt. Set of 4 Pieces, Height: 6.25", Bolt On, Textured Black. These fender flares will provide additional tire coverage, essential for protecting the bodywork when running oversized off-road tires, and give your truck a brawny, rugged look. Made of textured UV stable, heat resistant, ABS plastic, these flares are paintable and come with everything required for an easy, no drilling required, installation. 1999-2007 Ford F-350 Superduty Smittybilt M1 Fender Flares Bolt On Black (17390). Front and Rear M1 Fender Flares by Smittybilt. Set of 4 Pieces, Height: 6.25", Bolt On, Textured Black. These fender flares will provide additional tire coverage, essential for protecting the bodywork when running oversized off-road tires, and give your truck a brawny, rugged look. Made of textured UV stable, heat resistant, ABS plastic, these flares are paintable and come with everything required for an easy, no drilling required, installation. 2008-2010 Ford F-250 Superduty Smittybilt M1 Fender Flares Bolt On Black (17391). Front and Rear M1 Fender Flares by Smittybilt. Set of 4 Pieces, Height: 6.25", Bolt On, Textured Black. These fender flares will provide additional tire coverage, essential for protecting the bodywork when running oversized off-road tires, and give your truck a brawny, rugged look. Made of textured UV stable, heat resistant, ABS plastic, these flares are paintable and come with everything required for an easy, no drilling required, installation. 2008-2010 Ford F-350 Superduty Smittybilt M1 Fender Flares Bolt On Black (17391). Front and Rear M1 Fender Flares by Smittybilt. Set of 4 Pieces, Height: 6.25", Bolt On, Textured Black. These fender flares will provide additional tire coverage, essential for protecting the bodywork when running oversized off-road tires, and give your truck a brawny, rugged look. Made of textured UV stable, heat resistant, ABS plastic, these flares are paintable and come with everything required for an easy, no drilling required, installation. 2011-2015 Ford F-250 Superduty Smittybilt M1 Fender Flares Bolt On Black (17392). Front and Rear M1 Fender Flares by Smittybilt. Set of 4 Pieces, Height: 6.25", Bolt On, Textured Black. These fender flares will provide additional tire coverage, essential for protecting the bodywork when running oversized off-road tires, and give your truck a brawny, rugged look. Made of textured UV stable, heat resistant, ABS plastic, these flares are paintable and come with everything required for an easy, no drilling required, installation. 2011-2015 Ford F-350 Superduty Smittybilt M1 Fender Flares Bolt On Black (17392). Front and Rear M1 Fender Flares by Smittybilt. Set of 4 Pieces, Height: 6.25", Bolt On, Textured Black. These fender flares will provide additional tire coverage, essential for protecting the bodywork when running oversized off-road tires, and give your truck a brawny, rugged look. Made of textured UV stable, heat resistant, ABS plastic, these flares are paintable and come with everything required for an easy, no drilling required, installation. 2004-2008 Ford F-150 Smittybilt M1 Fender Flares Bolt On Black (17393). Front and Rear M1 Fender Flares by Smittybilt. Set of 4 Pieces, Height: 6.25", Bolt On, Textured Black. These fender flares will provide additional tire coverage, essential for protecting the bodywork when running oversized off-road tires, and give your truck a brawny, rugged look. Made of textured UV stable, heat resistant, ABS plastic, these flares are paintable and come with everything required for an easy, no drilling required, installation. 2009-2014 Ford F-150 Smittybilt M1 Fender Flares Bolt On Black (17394). Front and Rear M1 Fender Flares by Smittybilt. Set of 4 Pieces, Height: 6.25", Bolt On, Textured Black. These fender flares will provide additional tire coverage, essential for protecting the bodywork when running oversized off-road tires, and give your truck a brawny, rugged look. Made of textured UV stable, heat resistant, ABS plastic, these flares are paintable and come with everything required for an easy, no drilling required, installation. 2015-2015 Ford F-150 Smittybilt M1 Fender Flares Bolt On Black (17395). Universal Front and Rear M1 Fender Flares by Smittybilt. Set of 4 Pieces, Height: 6", Bolt On, Textured Black. These fender flares will provide additional tire coverage, essential for protecting the bodywork when running oversized off-road tires, and give your truck a brawny, rugged look. Made of textured UV stable, heat resistant, ABS plastic, these flares are paintable and come with everything required for an easy, no drilling required, installation. 2002-2008 Dodge RAM1500 Smittybilt M1 Fender Flares Bolt On Black (17490). Front and Rear M1 Fender Flares by Smittybilt. Set of 4 Pieces, Height: 4.5", Bolt On, Textured Black. These fender flares will provide additional tire coverage, essential for protecting the bodywork when running oversized off-road tires, and give your truck a brawny, rugged look. Made of textured UV stable, heat resistant, ABS plastic, these flares are paintable and come with everything required for an easy, no drilling required, installation. 2002-2008 Dodge RAM2500 Smittybilt M1 Fender Flares Bolt On Black (17490). Front and Rear M1 Fender Flares by Smittybilt. Set of 4 Pieces, Height: 4.5", Bolt On, Textured Black. These fender flares will provide additional tire coverage, essential for protecting the bodywork when running oversized off-road tires, and give your truck a brawny, rugged look. Made of textured UV stable, heat resistant, ABS plastic, these flares are paintable and come with everything required for an easy, no drilling required, installation. 2002-2008 Dodge RAM3500 Smittybilt M1 Fender Flares Bolt On Black (17490). Front and Rear M1 Fender Flares by Smittybilt. Set of 4 Pieces, Height: 4.5", Bolt On, Textured Black. These fender flares will provide additional tire coverage, essential for protecting the bodywork when running oversized off-road tires, and give your truck a brawny, rugged look. Made of textured UV stable, heat resistant, ABS plastic, these flares are paintable and come with everything required for an easy, no drilling required, installation.